In looking at Filipino contemporary art, we have to remember that Filipino culture has been shaped by cultures from other realms as well, with Filipino being under foreign influences during the colonization eras. Thus, instead of looking at the culture imparted to us by outlanders as colonialism, we could look at it as something that contributes to the richness of our culture and something that makes Filipino culture even more colourful. I realized this from going to CCP and the National Museum for my fieldwork. In relating the concept of kapwa to Filipino contemporary art, I would like to not just look at how the concepts of ‘togetherness’, ‘community’, and ‘not doing things alone’ are portrayed in the Philippine context, but also to look at the influence of other cultures. This is also because of the concept of kapwa having two categories, which are Ibang Tao (“outsider”) and Hindi Ibang Tao (“one-of-us”). What I have noticed is that foreigners and the culture they bring with them are openly accepted, that these foreigners seem like they are close to not belonging to the Ibang Tao category anymore (they are still considered outsiders due to the fact that they come from other countries). Nonetheless, we take the effort and have ways of understanding people from the Ibang Tao group, and one of those ways is to look at their artwork. In their galleries, National Museum has carved religious images from the Spanish colonization era, paintings that depict the uprising in Ilocos against colonial rule (Basi revolt), paintings of the portraits of (American) politicians who were relevant during the American occupation, and Greek sculptures. For me, what really exemplified the concept of kapwa the best and the most among the other artworks are the Basi revolt series of paintings by Esteban Villanueva of Vigan (1821) and the Philippine Charity Sweepstakes painting by Pablo Amorsolo, 1938. The Basi revolt occurred in 1807 Ilocos Norte, and revolves around the Ilocanos’ love for basi, or sugarcane wine. In 1786, the Spanish colonial government took the manufacture and sale of basi, effectively banning private manufacture of the wine. Ilocanos were forced to buy from government stores, and from this the wine-loving Ilocanos rose in revolt. Spanish troops were the losing side. The Basi revolt set of paintings by Esteban Villanueva (1821) strongly exemplify the concept of pakikipagkaisa, which means “being one with others”. To be one with others is to share the same set of beliefs and values. Contrary to the lower levels of pakikipagkapwa (e.g. pakikisangkot, pakikipag-palagayang loob, pakikisalamuha), the people depicted in the paintings share this set of beliefs and values that led them to revolt against the Spaniards, be it concerning a love for something (such as wine). When we hear Philippine Charity Sweepstakes, I’m sure that Lotto is the first thing that comes to mind. We might think that there’s nothing special about Lotto since it’s just about scratching cards and trying your luck out (and squandering money if you can’t get enough of trying your luck out), right? You realize that it’s actually more than that. Amorsolo’s painting of Philippine Charity Sweepstakes literally depicts a woman in the center of the piece, holding her arms out wide, in the background of Filipinos who seem to be tired from working. For me, the woman symbolizes freedom from hardship. The workers symbolize working hard for their families’ daily bread. I relate this to the concept of kagandahang-loob or “shared humanity”. Kagandahang-loob is a linking socio-personal value in relation to pakikipagkapwa. It refers to being able to help other people in dire need due to a perception of being together as a part of one Filipino humanity. In real life, the simple act of buying sweepstakes to try out your luck can already help those who are uncertain of having their daily breads for tomorrow. Buying one sweepstake card is not enough, but the collective spending of Filipinos for these sweepstakes could be a collective effort in helping the poor. All in all, every artwork in the Philippine National Museum reflects Philippine culture even with the influence of foreign cultures. Others don't necessarily relate the concept of pakikipagkapwa, like paintings about nature and sculptures of human bodies, but they still mirror what the artists see and feel during those times they were doing these artworks. They make you feel as if you were in their shoes as well. This in itself could still be related to pakikipagkapwa in terms of the pivotal interpersonal value of pakiramdam, or shared inner perceptions, since you try to put yourself in the artists’ shoes and in a way perceive others’ emotions. All in all, every artwork reflects the Filipino identity being immersed in different cultures. And every artwork, not just paintings of Jose Rizal, reflects nationalism from being able to show that we could rise up against the negative connotations of colonialism, and in the end still be open-minded in accepting the culture that is imparted on us at the same time. 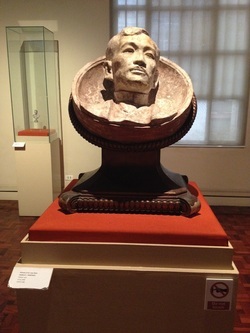 Filipino artworks also make us reflect about the societal values of dangal (dignity) and kalayaan (freedom and mobility) in looking at works that portray freedom from slavery and oppression such as the Basi revolt and Rizal sculptures, as well as the idea of pakikibaka or the ability of Filipinos to undertake revolutions and uprisings against a common enemy.